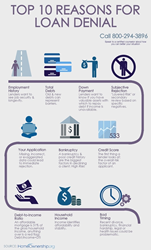 While there are many reasons for a loan denial, Springboard’s program is focused on educating the consumer on ways they can improve the financial factors that may have contributed to the adverse decision. Springboard Nonprofit Consumer Credit Management, Inc. (“Springboard) has developed a comprehensive counseling and education program to help consumers understand and deal with loan denials. It is estimated that fifty percent of refinance applications are denied and roughly 30 percent of prospective homeowners who apply for a mortgage are turned down. The Loan Denial Assistance Program™ is part of Springboard’s commitment to sustainable homeownership. Springboard is approved by the United States Department of Housing and Urban Development and is the largest nonprofit consumer credit counseling agency on the West Coast. “While there are many reasons for a loan denial, Springboard’s program is focused on educating the consumer on ways they can improve the financial factors that may have contributed to the adverse decision. By understanding and taking action to improve these factors, consumers have the ability to reapply with renewed confidence,” said Joanne Cordero Springboard’s senior vice president of operations. “We are excited to partner with lenders who want to provide a safe haven for consumers they have turned down for a mortgage loan. As we continue to recover from the worst housing crisis in 60 years and, Springboard’s Loan Denial Assistance Program provides value to a growing population of mortgage seekers. This is a win-win opportunity for lenders and consumers,” said Cordero. For more information, please contact Taryn Gaynor, manager of partnerships at 951-781-0114 ext. 1070 or via email at Taryn.Gaynor(at)Springboard(dot)org. About Springboard Nonprofit Consumer Credit Management, Inc.
SPRINGBOARD® Nonprofit Consumer Credit Management, Inc. is a 501(c)(3) nonprofit personal financial education and counseling organization founded in 1974. Springboard is a HUD-approved housing counseling agency and a member of the National Foundation for Credit Counseling, a national organization of nonprofit credit counseling agencies, and a member of the Association of Independent Credit Counseling Agencies. The agency offers personal financial education and assistance with credit counseling, housing counseling, debt and money management through educational programs and confidential counseling. Springboard is accredited by the Council on Accreditation, signifying the highest standards for agency governance, fiscal integrity, counselor certification and service delivery policies. The agency provides pre-bankruptcy counseling and debtor education as mandated by the bankruptcy reform law. The agency offers nationwide phone counseling services and has locations in California, Arizona, Nevada, New Mexico, Texas, Massachusetts, South Carolina, Florida and Maryland for in-person counseling sessions. Not all types of counseling are available in-person at all locations, please call for details. For more information on Springboard, call 800-449-9818 or visit their web site at http://www.Springboard.org.